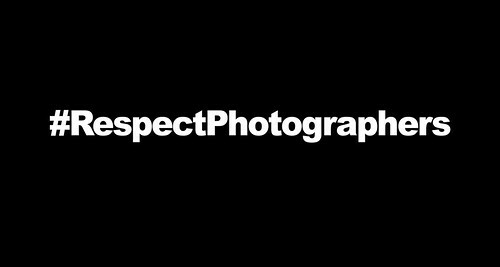 This RANT is directed at the CEO of Live Nation Michael Rapino (@rapino99 on twitter) and to ask him to start to #RespectPhotographers. Please be sure to tweet this video at hashtag at Michael to get his attention. It recently came to my attention that there was a job opening for house photographer at the soon to be opening Ascend Amphitheater. 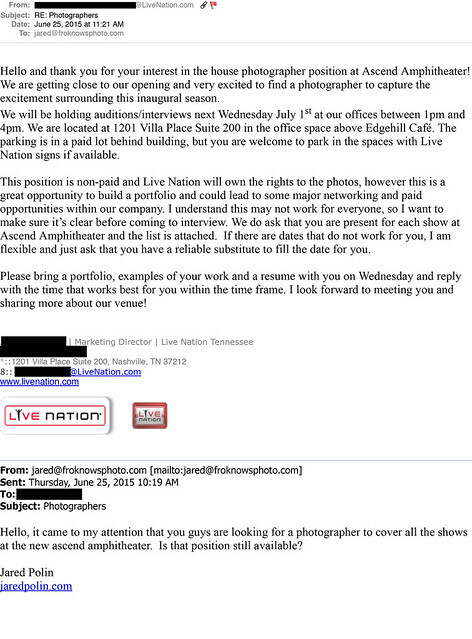 I decided to e mail them about the photography position and received and e mail listing the position. You can see the entire e mail down below. Here are a few excerpts from it. “Hello and thank you for your interest in the house photographer position at Ascend Amphitheater! We are getting close to our opening and very excited to find a photographer to capture the excitement surrounding this inaugural season. How does this make sense. Live Nation wont pay you for your work but they will ask for all the rights. But it’s a great opportunity to build a “portfolio”? That line is overused and a major slap in the face. You need to make money for your work, to eat, to live so on so forth. Everyone gets paid from the band down at a venue so why should the photographer be left out? 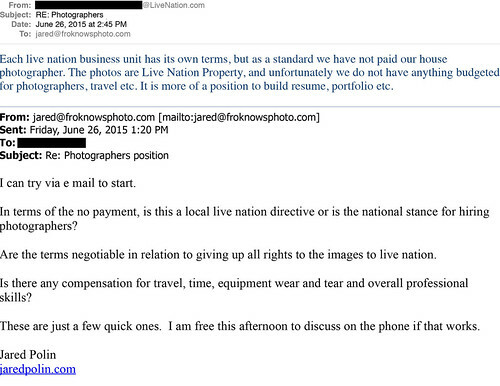 As a “standard” you don’t pay photographers? What kind of standard is that, change it, respect us like we respect you. 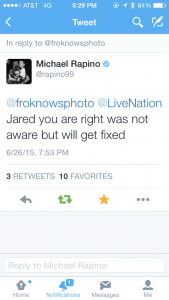 The CEO of Live Nation has responded via twitter, see the screen grab below.